The land of shamrocks and St Patrick's Day, Ireland captures the imagination with its lilting charm. Though it's a relatively small country, Ireland's countryside includes an impressive range of landscapes, from towering mountains, magical woodlands, rolling pastures, and rocky coastlines, to shadowy peat bogs. Sleepy villages dot the countryside while cosmopolitan cities dominate the cultural landscape. While its reputation may be riddled with clichés, a holiday in Ireland is full of pleasures and surprises, and the country's appeal has little to do with leprechauns and shillelaghs. Ireland's culture has permeated the global consciousness, particularly through literature and music. Celebrated writers like James Joyce, WB Yeats, Oscar Wilde and Jonathan Swift called the Emerald Isle home; Irish music and dance has circled the globe with breakout acts like Riverdance and U2. A holiday in Ireland offers myriad possibilities. Outdoor enthusiasts can hike scenic routes like the Ring of Kerry and explore the beauty of Killarney National Park; history buffs will marvel at ancient buildings like St Patrick's Cathedral and Blarney Castle; avid readers won't want to miss the James Joyce Museum and Trinity College Dublin. Those simply looking for a good time can find one in Dublin's lively Temple Bar District, or in almost any pub in this lively and sociable society. The best time to visit Ireland is from May to September. The weather in Ireland can be cold and damp all year long, but the months from late spring to early autumn are the best for sunny and warm weather. Read more on Ireland's Climate and Weather. - Take a guided tour of the Guinness Storehouse. - Drive the scenic Ring of Kerry route on the Iveragh Peninsula. - View the majestic Cliffs of Moher in County Clare. - See the Book of Kells at Trinity College Dublin. Read more about Ireland Attractions. - Trace your Irish ancestry at the National Library of Ireland. - Enjoy the music and nightlife of Dublin's Temple Bar District. - Attend a service at the impressive St. Patrick's Cathedral. 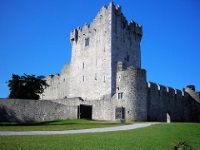 - Tour Blarney Castle and kiss the famous Blarney Stone. There are plenty of direct cheap flights to Ireland on budget carriers, so getting to Ireland from the UK is a breeze. Getting to Ireland from the US isn't as quick, but there are direct flights from the US to Dublin and Shannon airports. Get more information on Ireland Airports. Angela's Ashes by Frank McCourt, Dubliners by James Joyce, and The Van by Roddy Doyle. Cailín na Gaillimhe (Traditional), Irish Washerwoman (Traditional), and Riverdance (Anuna). Leap Year (2010), Mad About Mambo (2000), and The Wind That Shakes the Barley (2006). Claddagh jewellery and Irish whiskey. It's a good idea to pack lots of layers for a holiday in Ireland, as the weather can be unpredictable any time of the year. Dublin is the place to be on St Patrick's Day for one of the world's biggest parties. James Joyce fans can celebrate Bloomsday in style, held in Dublin each June. The Festival of World Cultures draws music and culture lovers from all over the world. Read more about Ireland Events. Ireland is the world's only country with a musical instrument for a national symbol: the harp. Europe's 'Emerald Isle', Ireland is a patchwork of beautiful landscapes, quaint villages and cosmopolitan cities that form a thousand-year-old civilisation with a modern attitude. A recent Multimedia graduate from Dublin City University, Charlie is proud of his country and enjoys exploring and promoting it. Charlie works for CARHIRE, a car rental company in Ireland with 14 nationwide locations. We are looking for contributors for our Ireland travel guide. If you are a local, a regular traveller to Ireland or a travel professional with time to contribute and answer occasional forum questions, please contact us.